From Comicave Studios. 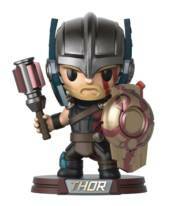 This special brand-new line of Go Big collectibles was created exclusively for the Thor: Ragnarok red carpet premiere, and are now avaialble to order from your local comic shop! These large scale super-deformed vinyl figures are sure to bring a big dose of cuteness to any display. Collect Hulk (16' tall) or Thor (14' tall).